Omnibus’ Bus line #82 has a stop at Cherry @ Village Sb Fs, right across the street. Get picked up and dropped off at your leisure! 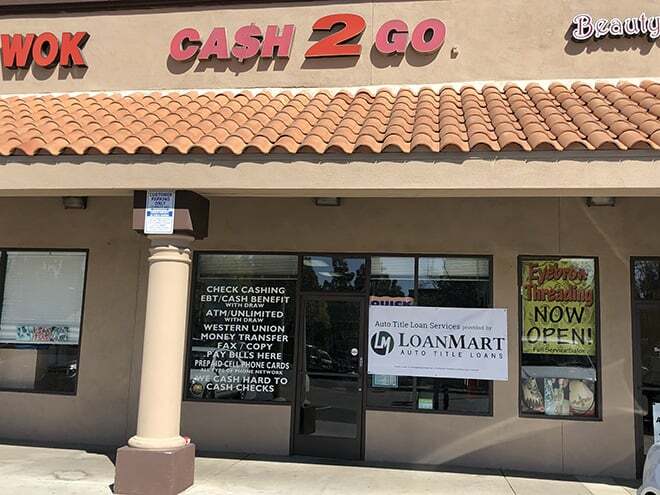 This Cash 2 Go is surrounded by Pancho Villa’s, Pizza Hut, Rio Ranch Market, WaBa Girll, and AutoZone. Have you been struggling to take care of your financial obligations this month? Does it seem like there’s a never-ending pile of bills in the mail, no matter what you do? Balancing a budget and dealing with unanticipated expenses may be frustrating. If you’re a resident of Fontana or the surrounding area in need of funds, LoanMart invites you to consider an auto title loan. Using your free-and-clear vehicle title as collateral, you may qualify to borrow up to $30,000 with an auto title loan in Fontana1. With terms ranging from 12 to 48 months, LoanMart gives you a series of affordable monthly payments. It’s free to apply, so get started today and experience all that LoanMart has to offer. Apply for an 800LoanMart Auto Title Loan in Fontana! Call toll-free number to apply over the phone with a friendly 800LoanMart agent, or submit an information request form online. Once approved, sign your loan agreement and collect your funds!